Splash-resistant goggles protect while kits for caustic and acid spills clean up to one liter of four solvents. A storage container allows for safe disposal after cleaning. 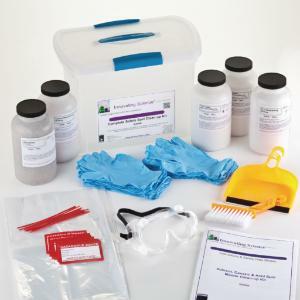 Ordering information: This kit contains enough material to clean up a liter of four solvents in the lab. It is complete with instruction sheets and SDS. The kit contains diatomaceous earth, an acid spill clean-up kit, a caustic clean-up kit, vermiculite, splash-resistant goggles, nitrile gloves, a dustpan and brush set, and a spill kit storage container. Replacement materials are available separately for you to simply restock your kit after a spill.